Getting an early jump on the weekend, so I won't be too attentive to comments posted here, but I didn't want to begin my serious R&R without mentioning, again, the fantastic job that has been done by firefighters from all over the state and country in trying to wrestle the current horrendous southern California fires into submission. 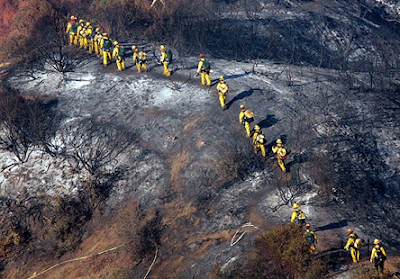 The last numbers I heard included well over 4,000 firefighters working on our fires and doing a darn good job of it. 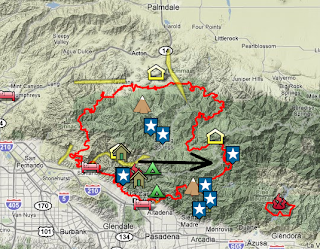 The big one, the Station fire, is now being described as the largest blaze in Los Angeles County's modern history - 144,000 acres and is still growing. The "air force" that has been fighting these fires has been something to watch. The 747 that drops 20,000 gallons of retardant or water is an amazing machine to watch operating. The DC-10 drops a little less and the Martin Mars Flying Boat seems to have barely enough power to stay airborne, but does the job. And, the helicopters are magnificent. The precision with which those brave pilots do their jobs is truly amazing. I leave you with these two clips for your viewing pleasure. The first is a short one that shows just how dangerous flying into these fire situations can be. It's not from our current fires. The second is a tribute to firefighters - one of many available for viewing on youtube. This one, however, is pretty darn area-specific. Thanks, again, to all the firefighters who have risked their lives to protect us all. Starting forest fires is wrong, but roasting people? That’s just plain sick. Be glad you are not in charge. I am.